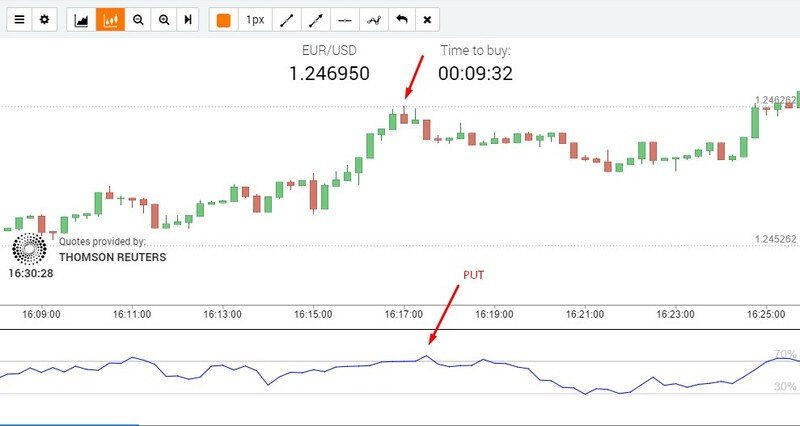 The RSI is one of the most popular oscillators which perfectly works on different market conditions and help us to define exact entrance points. 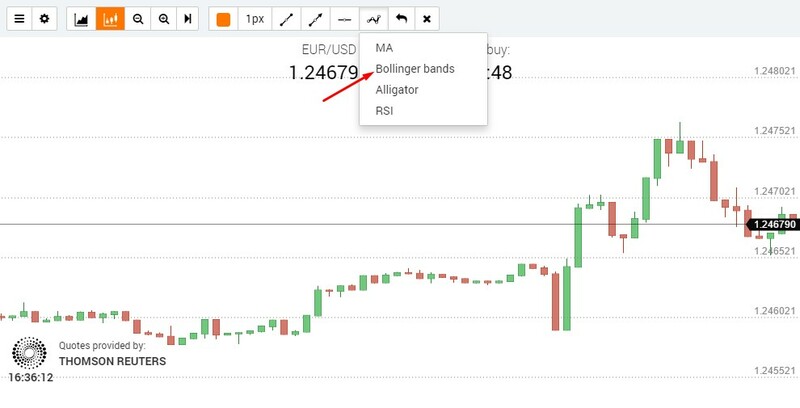 Choose the “Relative Strength Index” from the list of indicators. The RSI (Relative Strength Index) is a technical indicator and an oscillator following the price movements that ranges between 0 and 100. The RSI belongs to a group of the most popular oscillators. It is equally good for the market trends and the sideways moves. The RSI compares the latest asset price rise to the price fall and provides this information as a figure in the range from 0 to 100. 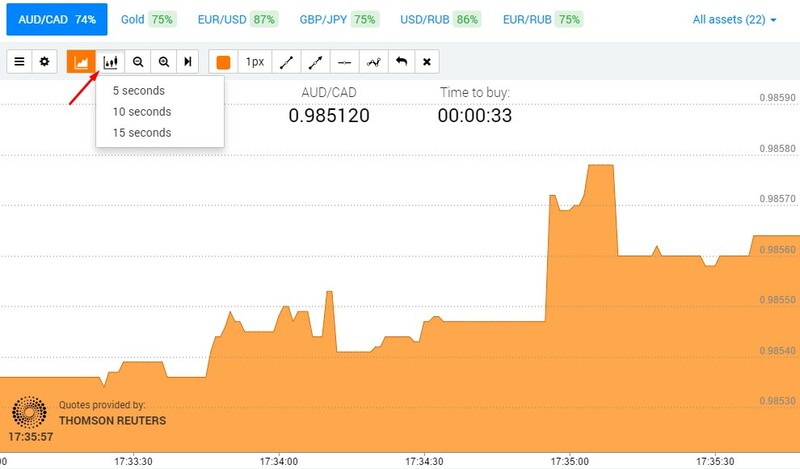 Overbuy (the indicator level is above 70%) – the market went up above the normal level and we are expecting the price will move down soon. Oversell (the indicator level is below 30%) – the market went down below the normal level and we expecting the price will move up soon. 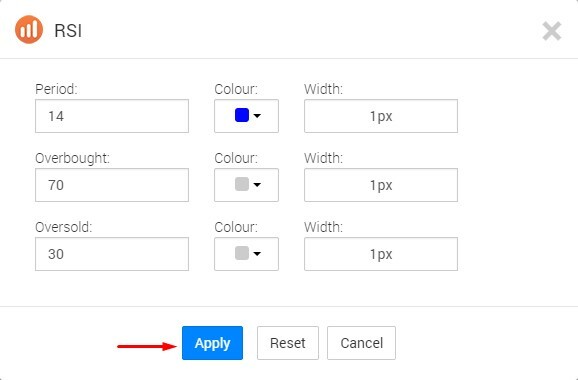 Apply the RSI indicator to the chart and choose a 26 period setting. Overbuy – the indicator level is above 70% a trend reversal signal for buying the put option. .
Oversell – the indicator level is below 30% a trend reversal signal for buying the call option. Divergence. The divergence signal is received in case of discrepancy between new highs or lows on the oscillator chart and the price. If the new high on the oscillator chart is below the previous one, while a new high on the price chart is above the previous one, we see discrepancy between the oscillator and the price. This signals upcoming uptrend reversal and subsequent sales. 2. Graphic patterns. Graphic patterns are often formed on the RSI chart (classic patterns) and are used by the traders for analyzing the price charts. .
Graphic patterns. 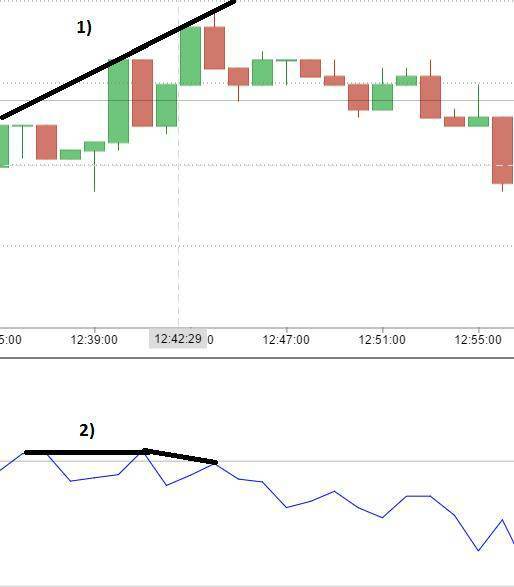 Graphic patterns are often formed on the RSI chart (classic patterns) and are used by the traders for analyzing the price charts. Support and resistance levels . on the RSI are often more clear than those on the price charts. Defining points following the max and min values of the oscillator. The problem of most technical indicators is the fact they are lagging. It happens because the calculation formula is attached to an instrument price, that is when the price starts rising, momentum makes the indicator move higher and vice versa. Therefore, false signals and delays are emerging. An effective way to get over this disadvantage is to use divergence effect. 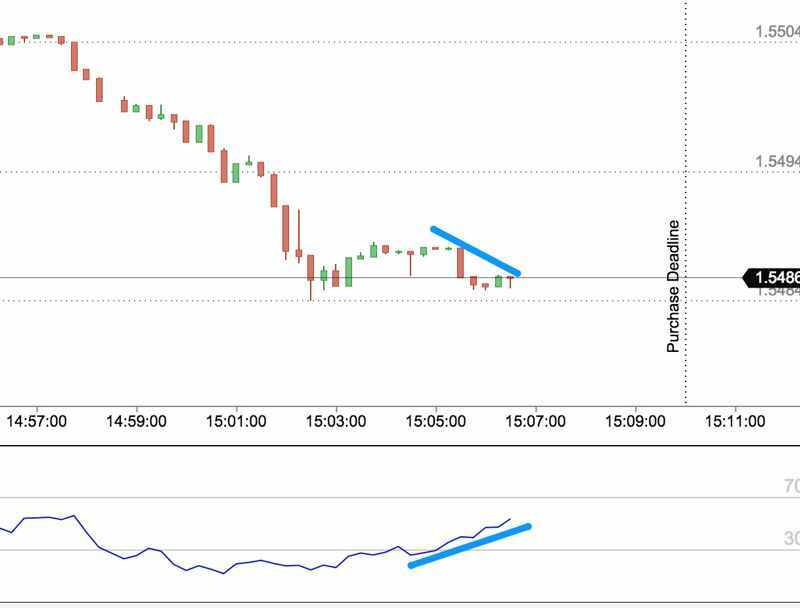 Divergence occurs when there is a discrepancy between the price and the technical indicator, in brief, this is an indicator denial to confirm a higher price high. The price divergence is a reversal model, and for its detection the oscillator type indicators, like the RSI, are used. 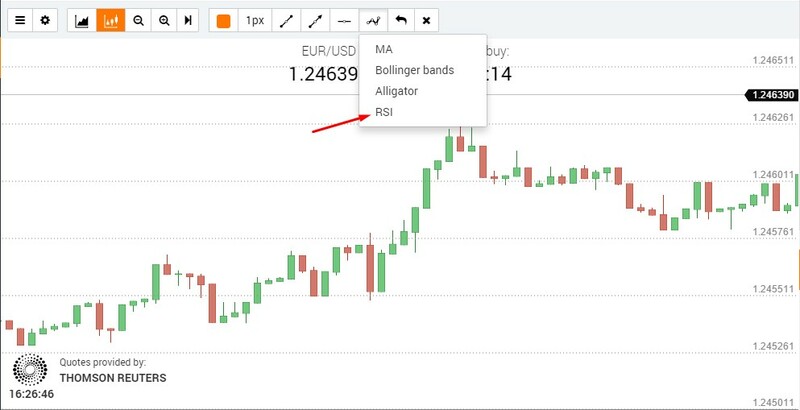 Apply the RSI indicator to the chart with a “21” period adjustment . Search the divergence between the current price direction and the indicator direction. In the sample, after rising, the price formed a new high (1), at the same time, the RSI oscillator refused to follow the price and showed weakness (2). This is the divergence in its display, it indicates us that further direction change most likely will follow. While the divergence phenomenon is considered to be rather strong technical signal, one should remember about money management methods and trade risks. The indicator shows the market point, where is the probabilities offset, that is the chance for a favorable outcome in the deal becomes much higher, but it does not guarantee 100% profitable trades.